You would think that a person who has always loved words and makes money as a voice-over talent – a career built upon interpreting words — would have started playing Scrabble in childhood. I can remember the first time I ever played Scrabble. Almost unbelievably, I went through my life without playing Scrabble until last May, as Drew and I finished a cruise and wanted to do something on the last night on-board the ship. I lost that first game but won a new hobby. We bought a Scrabble game when we got home, but we didn’t play it often. While watching the Ace of Cakes show on the Food Network one day, I saw a Scrabble cake designed for a person who is a tournament Scrabble player. It was the first time I ever heard of Scrabble tournaments. At that moment, I decided I would win a Scrabble championship. I have an extensive vocabulary. I used to whip through the find-a-word puzzle magazines, and I always liked to play Boggle. Once I decide upon a goal, I achieve it. With my intrinsic love of words, I thought a Scrabble tournament win couldn’t be far away. I’m sure this same kind of thought process goes through the minds of many people who suddenly decide to get into voice-over work. I wish I had a dollar for every time someone approached me with the line: “People always say I have a nice voice and that I should work in voice-over.” I always advise that folks interested in learning any new skill start with a book because it requires a minimal investment of time and money to learn whether you want to pursue the topic. I direct people interested in voice-over to my recommended list of books and previous blog entries like this one. In my mild-mannered quest for Scrabble dominance, I didn’t take my own advice about getting a book, at least at first. Another cruise at Christmas caused my Scrabble interest to grow, primarily because we couldn’t find a board to play all week. I decided to get serious and learn more about the game. No, I didn’t contact a Scrabble master and ask for free advice and shortcuts to Scrabble success. Instead, I bought some page-a-day calendars this year with Scrabble words and puzzles, and I also bought the book Everything Scrabble. After all, I need to get ready for my future tournament. Like establishing a voice-over career and everything else worth doing, though, if it were easy, everyone would do it. I admit that unscrambling the words and making the best plays on the calendar pages are sometimes impossible for me. I also confess that I have played probably fewer than 20 games in the last 9 months since this Scrabble fixation took root. I thought maybe my score would improve if I just had a different kind of practice material. I was looking at the Scrabble-related books in a bookstore the other day and saw Word Freak: Heartbreak, Triumph, Genius and Obsession in the World of Competitive Scrabble Players by Stefan Fatsis. I immediately obtained the book and started reading it. I’m still reading this eye-opening account, but, by page 30, I had changed my mind about entering a Scrabble tournament, at least any time soon. I discovered several things. First, the tournament games are limited to 25 minutes. I am always acutely aware of my time in voice-over as the runtime is always critical. Playing a board game under a time constraint would be a new challenge. More importantly, I don’t have the desire – much less the spare time — to put forth the tremendous effort necessary to become a Scrabble champion. The people in Scrabble tournaments spend major chunks of their discretionary time memorizing word lists, anagramming words out-loud, studying strategy books, and analyzing every rack’s play following each game. And playing Scrabble games is something they do relentlessly. They play against others in the park every weekend and against themselves in their living rooms everyday. They play against computer programs. They plan their lives around the next tournament even though tournament prize money and prestige seems in short supply. Think about it — how often do you see news coverage of a Scrabble championship? The serious players are members of the National Scrabble Association and eagerly look forward to receiving competition rankings in the mail. In short, they eat, breathe, speak, live, and dream about Scrabble. I think those in Scrabble tournaments must play the game for the sheer love of it. I couldn’t help but wonder how many newcomers to voice-over take the time to read one or more books on the field. Does obtaining work in voice-over seem as easy as pulling letters from a bag and making words? 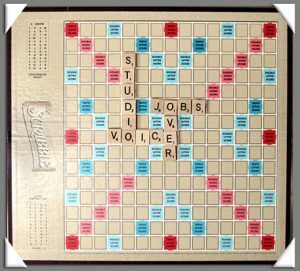 Championship Scrabble players and professional voice-over artists have more in common than just words. In both cases, those who are dedicated to their endeavor constantly practice their skills and look for every opportunity to learn something new about it. It takes time and work to become known as a player and even more of the same to stay in the game. Those who are truly successful are in it for the love of the thing. is not likely to make money nor find much fun in life. I will continue to play Scrabble at home and on vacation. I will do my puzzles and read the books because I enjoy the game and want to improve my scores. However, I guess I won’t ever be the recipient of a cake shaped like a Scrabble board. Might I suggest instead a cake that looks like a microphone? David and I are avid Scrabble players and have been playing for years. We find that it’s a great way to while away a couple of hours and also enjoy the challenges presented. No one game is the same. Thanks for opening the Scrabble door. I’ve been wondering how I might incorporate the game into VOX Daily somehow. During the summer, mentioning it was a goal of mine in a little book of future posts… perhaps I should give it a go! Hi, Stephanie! I should have known that you might enjoy a good game of Scrabble! 🙂 Obviously, my minor foray into the Scrabble world proves once again that people can achieve any goal — as long as they are willing to take the time to gain the knowledge and build the skills necessary for its attainment. Thanks again for stopping by and for all you do for the voice-over community. I love your blog! I was just making a list of goals, at the top of which was “Investigate Career In Voice-Over” b/c I know it’s much more than just wanting to do it and thinking it’s a cool way to earn a living. So I Googled something like “voice over career Atlanta” (where I’m considering moving over the next few years) and up pops the link to your blog. I’m reading ferociously! 🙂 I’m only a few entries in and have already printed out tips, placed an order on Amazon for 2 books, and gotten more than a few laughs. Thanks so much for helping those of us interested in this unusual career choice get a good start! Hi, Rhonda. Thank you very much for the nice comments! I’m glad if I have been of help to you and hope that you will enjoy future entries. Congratulations to you for having courage to take steps toward the life of your dreams, and best wishes for your success!